The survey found that 58 percent of Asian-American voters rated Democrats more favorably than Republicans. Asian-American voters are enthusiastic about the 2018 midterm elections, indicating potential for higher than normal turnout, but the voting bloc has largely not been contacted by political parties and candidates, a new survey has found. 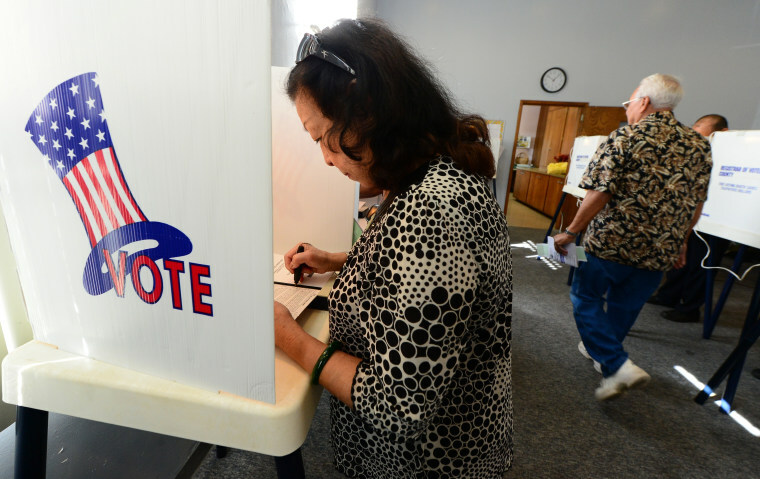 The 2018 Asian American Voter Survey, published Tuesday, reveals a number of insights about the Asian-American electorate, which numbered more than 6 million registered voters in the 2016 elections, according to U.S. Census data. Among the findings are that about 60 percent of Asian-American voters say they disapprove of the job President Donald Trump is doing; 50 percent say they have not been contacted or don’t know if they’ve been contacted by Democrats; and 62 percent say they have not been contacted or don’t know if they’ve been contacted by Republicans. “We believe that this information is crucial in accurately framing the narrative about the Asian-American electorate and providing detailed insight on how Asian Americans and Pacific Islanders stand on major national issues, how they view our political parties, and more importantly, how they feel about the upcoming midterm elections,” Christine Chen, executive director of APIAVote, a civic participation nonprofit that commissioned the survey, said Tuesday during a conference call announcing the findings. MidtermsThere hasn't been a Korean American in Congress since 1999. Come November, there could be 4. APIAVote conducted the survey with nonprofits AAPI Data, AARP, the Asian Pacific American Labor Alliance, and Asian Americans Advancing Justice. The groups interviewed 1,316 registered voters between Aug. 23 and Oct. 4 through landline and cellphone calls as well as web surveys. The interviews were conducted in English, Cantonese, Mandarin, Korean and Vietnamese. The reported overall margin of error was 3 percent. The survey found that Democrats are at an advantage with the Asian-American electorate this election cycle, with a majority of the group rating the party more favorably (58 percent) than the Republican Party (34 percent). Similarly, for Senate and House races, a majority say they would be inclined to vote Democrat (52 percent and 50 percent, respectively) than Republican (28 percent for both). PoliticsBefore Obama, Asian Americans voted Republican. The GOP wants to bring them back. Democrats also held an advantage in voter identification, with 38 percent of those surveyed identifying as Democrats compared to 22 percent as Republicans. Thirty-eight percent said they did not identify with either party. For the upcoming midterms, Asian-American Democrats had higher net enthusiasm — the proportion of more enthusiastic voters minus those who are less enthusiastic — at 42 percent compared to registered Asian-American Republicans (30 percent). The figures are a sharp contrast to 2014, when Republican voters posted greater net enthusiasm (14 percent) than Democrats (-2 percent). PoliticsNearly 40 percent of Asian-American voters don't favor a party. Can the DNC change that? When asked about Trump's job in office, a majority said they disapproved of his performance (58 percent), while 36 percent approved. This sentiment was not uniform among all ethnic groups: A majority of surveyed Vietnamese Americans approved of Trump (64 percent), the only surveyed group to do so. Filipino Americans were equally split, with 48 percent approving and 48 percent disapproving. Japanese-American voters gave Trump the lowest approval rating (14 percent). The survey found that Asian-American voters are concerned about a number of issues, the most important being the state of the economy and health care, with 50 percent of those surveyed saying those issues were “extremely” important. Survey respondents also indicated caring about education, gun control and national security. Generally, a plurality of Asian-American voters held progressive opinions: 44 percent favored bigger government that provides more services, 46 percent said gun control is extremely important, 64 percent favored a pathway to citizenship for undocumented immigrants, 46 percent agreed that the government should provide health insurance for all immigrants regardless of legal status, and 66 percent favored affirmative action programs to help minorities access higher education. The survey also included insights about voters' stances on labor issues such as livable wages, safe working conditions and employee access to quality health care. Across the board, the majority of respondents said these were all either extremely or very important. However, most voters were not familiar with the role of labor unions: Only 14 percent of respondents said they were very familiar the role of labor unions, while 28 percent reported being somewhat familiar. Alvina Yeh, executive director of the Asian Pacific American Labor Alliance, AFL-CIO, said there is an opportunity to educate the community about workers' rights and how labor unions can advocate for those issues. While the Asian-American electorate is eager about voting in the midterms, survey respondents reported sparse contact from political parties. Fifty-two percent of those surveyed said they were contacted by Democrats, while 40 percent said they had heard from Republicans. Forty-four percent said they were contacted by community organizations. The report notes that these figures are an improvement from 2014, when 35 percent were contacted by Democrats, 26 percent by Republicans and 28 percent by community organizations. Chen said that the Asian-American vote is up for grabs and she urged political parties and candidates to engage the group. “By connecting with Asian voters on a consistent basis and addressing and voting on issues that support their values, there is an opportunity to transform that 44 percent who do not feel close to either party,” she said.